We know it’s a beguiling weekend car for enthusiasts, but what has it been like to live with every day for the past year? For a clear indication of just how much fun the fourth-generation Mazda MX-5 has been to live with over the past year, just look at that bill for tyres: £860 for eight of the blooming things. We just couldn’t stop driving it hard, because this was a car that demanded to be discovered, compared, questioned, explored and enjoyed at every opportunity. The brief for the Mk4 MX-5, launched last summer, is well known – not that ‘tyre-shredder’ was in it. And it isn’t a tyre-shredder, of course, because that was all our doing. But more on that in a moment. Mazda’s brief, then, was to make the MX-5 smaller and lighter while keeping it fun and affordable. The MX-5 kept the classic front-engined, rear-wheel-drive roadster layout and now looks even better with Mazda’s lovely Kodo design language. With such a formula to work with and a track record like Mazda’s of making such a car, it hasn’t really been a surprise that our year in the latest MX-5 has been a good ’un. To jump straight into the dissection of the oily bits, you can have your MX-5 with one of two new normally aspirated engines: a 1.5 and a 2.0. 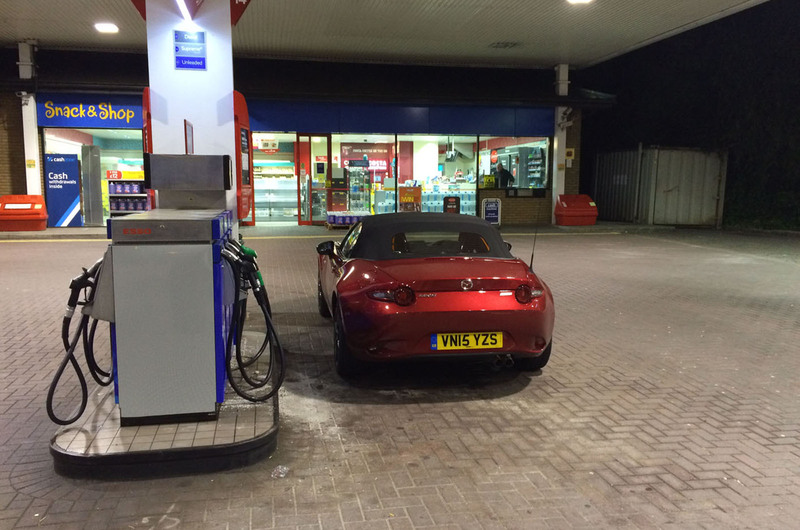 We went for the larger unit, so we had the MX-5 at its most powerful but, admittedly, not its absolute purest. In an era dominated by downsized turbocharged engines, it has been refreshing to drive a motor that goes against the trend. Mazda instead calls it ‘right-sizing’, offering the right-sized engine for a car with the right amount of power, rather than relying on a turbocharger to do all the work. It leads to a much nicer and more progressive driving experience, the engine smooth and linear throughout the rev range while coming alive at the top end. What’s more, fuel economy never dropped below 40mpg, no matter how hard it was driven on the road. I bet the same won’t be said of the 1.4-litre turbo that Fiat is putting in the MX-5’s sister car, the 124 Spider. The engine came hooked up to a six-speed manual gearbox. The gearlever is nice and stubby, the knob sitting snugly in your hand, and the action through the gate is slick. But I did struggle a bit with coming off the clutch when changing from first to second, smoothness in this shift proving beyond the ability of my agricultural left foot. There was nothing agricultural about the chassis, which was perhaps the sweetest part of all about life with the Mazda. 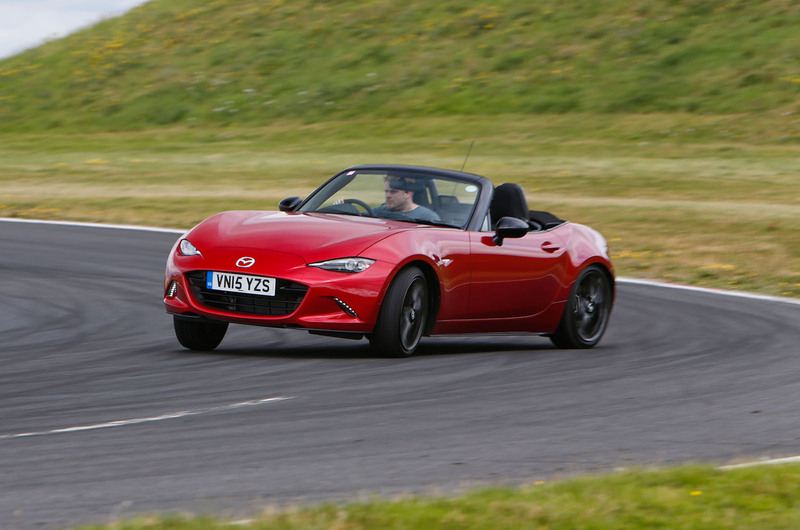 All MX-5s with the 158bhp 2.0-litre engine have a limited-slip differential, strut tower bar and 17in alloy wheels. From there, you have a choice of mid-range SE-L trim with normal suspension or the range-topping Sport trim with sports suspension and Bilstein dampers. Having sacrificed purity with the engine, we went for the standard set-up, which proved to be a fine choice for everday use. The MX-5 rides very well and steers and handles ever better. 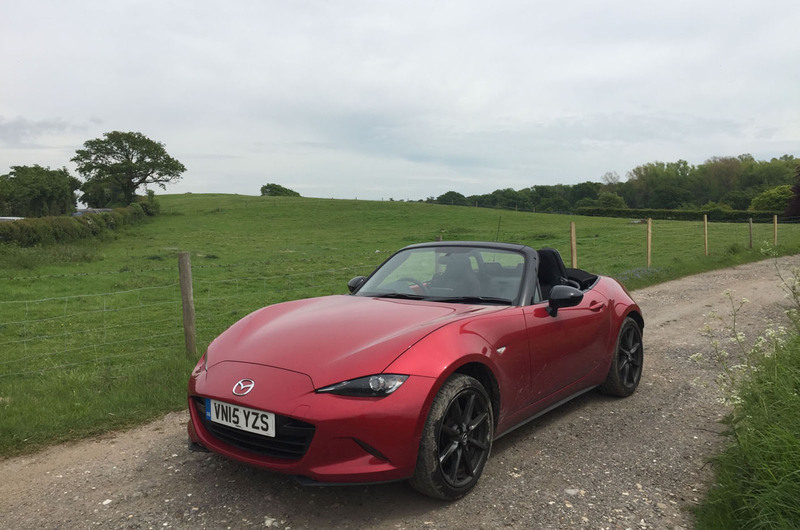 Although I have a fairly dull 25-mile commute on main roads in each direction every day, I found the MX-5 one of the most enjoyable things in which to do it because it was such an interactive and involving driving experience. The MX-5 is the kind of car that tells you what it’s doing. The steering is precise, with nearperfect weighting for the level for performance. Every part of the car that you interact with feels tuned and set up by someone who knows what they’re doing and who likes driving. A true MX-5, then. On circuit, where the Mazda frequently found itself, there was more roll and slightly less sharp handling than with a Sport version, but I found that altogether more endearing. You could still explore the car’s limits, and adjust it while it was there, but the car was as much fun to drive at seven-tenths as it was in all-out attack mode, such was the sweetness and delicacy of it all. It was this track use that did for a lot of the tyres. Two fronts and two rears were seen off at different times due to extended circuit use, which prompted a switch to winter tyres all round at one point. This softened the drive even more and some testers even preferred the more buttery everyday usability. Admittedly, others hated it on winter rubber. As good as it was on a circuit and on shorter trips, the MX-5 had its limitations on longer journeys. Although 100-milers were fine, 200-milers were less so. The cabin’s shrink-wrapped size began to grate on such journeys and it felt even more cramped with a passenger. The limited padding in the seat also led to, as the French say, a numb arse. Opening the roof always helped, though. The MX-5’s roof is manual and a doddle to fling back and store in one swoop of the arm. The speed at which you could do it all depends on your strength. You might be able to battle the wind resistance and do it at 100mph if you’re a Russian athlete. Problems? Surprisingly for a Japanese car with only 15,000 miles on the odometer, there were a couple. The stitching on one of the seats came unpicked. The tyre pressure monitoring system randomly turned itself on a few times before a check and a reset threw up no problems. And after a service that resulted in a software update for the infotainment system, the DAB radio reception became patchy. On the subject of that infotainment system, the MZD-Connect set-up with a 7.0in screen is a lovely thing to use, chiefly because it doesn’t have a blasted touchscreen and you can control it with a nice big rotary wheel. Also, the few buttons around it are easy to learn and locate, making for a safe, intuitive drive. Intuitive: now that’s a good word to describe the MX-5 as a whole. You look at it, hear the name and think: involving, fun-to-drive sports car. Mazda hasn’t disappointed. In fact, it’s better than ever, which is no mean feat in an era where we’re increasingly seeing car makers mess up their driving icons (Renault Sport Clio, silly dual-clutch automatic gearbox; Porsche 718 Cayman and Boxster, silly turbocharged engine). The MX-5 remains an MX-5, and a better MX-5 at that. We’ll miss it. Well, I will, but Steve Cropley won’t. He’s just bought the thing. Sounds terrific, but why the big discounts? As an enthusiast, I find it slightly alarming that dealers are blatantly advertising 15% discounts on the MX5 - and this all before Summer has properly ended. Has the world fallen out of love with two-seater roadsters to the extent that dealers have to try so hard to shift the metal? Or has Mazda been too ambitious in estimating demand? Either way, in the short term it's good news for buyers, but less so for future depreciation and the long term future of affordable sports cars.